What Is In Those Spicy Nuts? 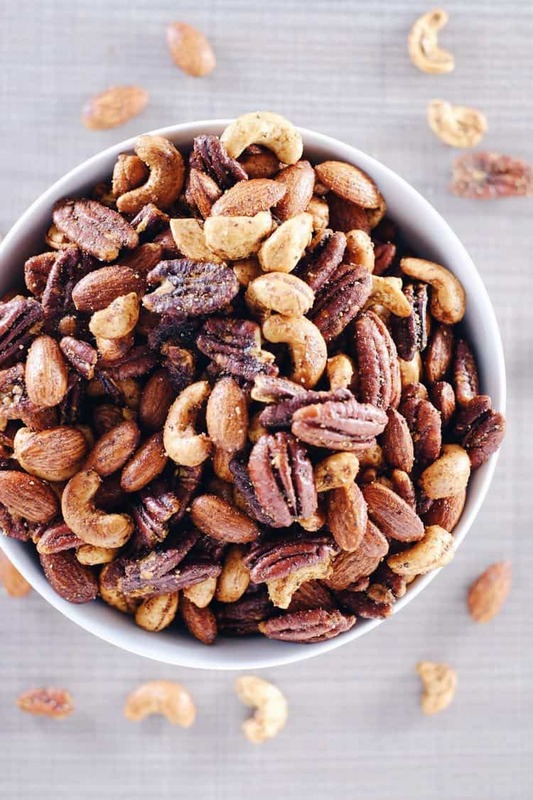 Have you looked at the ingredients on many packages of nuts and mixed nuts or flavored nuts? Some are better than others, but many of them are roasted in not so good for you oils and often include sugar and other ingredients that seem unnecessary. 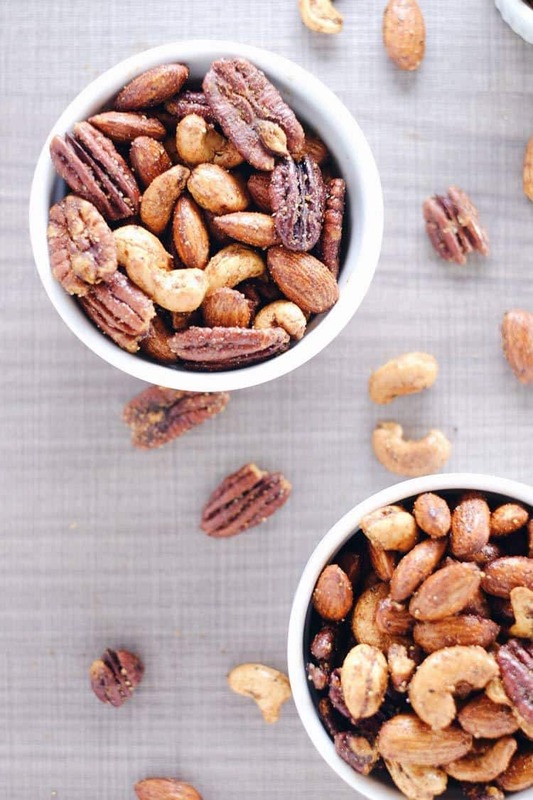 You will roast these spicy nuts yourself, which means you control all of the ingredients. We chose olive oil for a little extra flavor and kept it simple with some tasty spices and seasonings! Don’t be surprised when you find yourself venturing back for more! 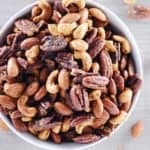 These spicy nuts are super addicting, so be kind to your belly and don’t eat too many, and even consider soaking and sprouting your nuts in advance to make them easier to digest. I like this post that explains why you should sprout and how to do it. 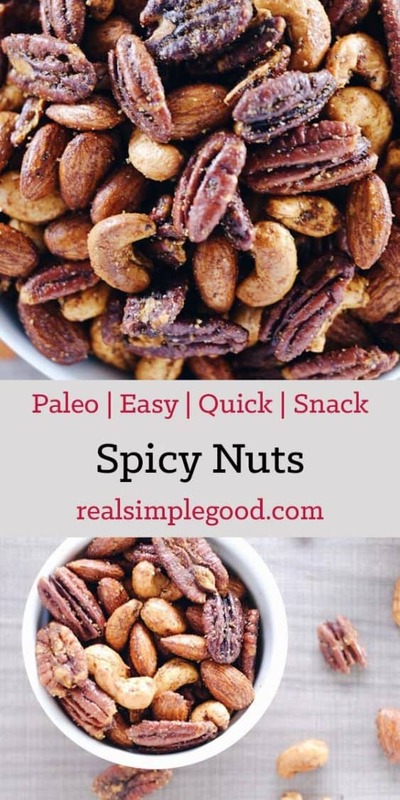 Go ahead and roast a batch of these spicy nuts! They are addicting and a great snack for while you’re out and about on a busy day. Let us know how it goes by leaving a comment below. Also, take a photo and tag us on Instagram @realsimplegood, so we can check it out! You can also find some other yummy snack inspiration in our post – 50 Clean Eating Snacks! Preheat oven to 350 degrees Fahrenheit and line a baking pan with parchment paper. Place nuts in single layer on the baking pan. Place in oven to roast for 15 minutes, turning halfway through. While nuts are roasting, prepare spice mixture by combining chili powder, garlic powder, cumin, black pepper, salt and cayenne pepper in a small bowl. Remove nuts from oven and allow to cool. Transfer to a bowl and coat nuts with olive oil, then coat with spice mixture. Sometimes the lazy option is the way to go! Thanks for coming back and leaving a comment! Very good. I like this as an alternative snack to chips for sure. I found that a 1tsp addition of brown sugar was a nice touch of sweet and salty. Perfectly good just as the recipe calls for though. So glad you liked the recipe! Thanks for taking the time to come back and leave a comment! YUMMY! Two things…all I had were pecans and I mistakenly added chipotle chili powder instead of red pepper. I said what the heck and added both. 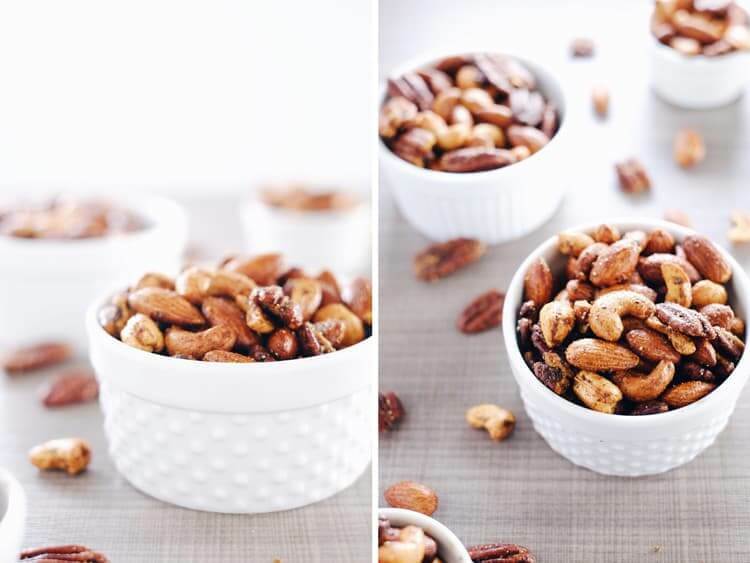 I usually make the candies pecans for Christmas…I think I’ll make a batch of these up for gifts next year also. Very good recipe, thank you!